Nashville’s spirit of “you never know who you’re gonna see” is embodied in the music party that showcases the city’s best and brightest- Whiskey Jam. The concert series has provided good music to good friends at a good party for over 7 years. During its time as a Nashville staple, Whiskey Jam has had 158 (and counting) number 1 songs written or performed by guests with over 350 consecutive Monday night shows in Music City. With concert stats like that how do you spread your message of success on social media? With UPshow, of course! Whiskey Jam’s loyal fanbase (hey, they still showed up for a show in a blizzard) has reached over 4 million impressions on social media within the first few months of UPshow. There's no place like Music City to spot big name musicians grabbing groceries at Kroger. Then at night, these country crooners take the stage next to up-and-coming singer songwriters (celebs, they're just like us)! Whiskey Jam is the prime opportunity for Nashville to get their fix of current music and also get a glimpse of what's coming up for the music industry. And while the crowds can snap pics of the amazing performances, when those country stars share their Whiskey Jam moment on UPshow and social media, their massive amount of followers sees and is definitely following up on when they can get to the next Whiskey Jam session. Click through the above images to see the guitar-slinging celebs and newbies taking the stage and UPshow at Whiskey Jam! The performers are not the only ones at Whiskey Jam to get star-studded treatment. With the UPshow screen placed perfectly next to the stage the crowd can be in the party and in the spotlight at the same time. 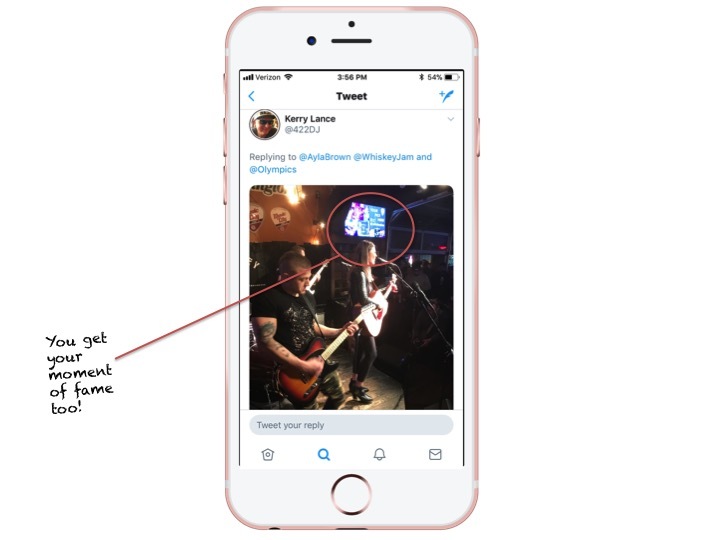 This encourages concert guests to post their Whiskey Jam moment and the envious social media post will circulate their web of friends, promoting the concert even further. Click through the above images to see how UPshow captures fan's fame! We all love a good merch table, right? Who doesn't want to represent their awesome night with a collectable tee? Even better, why not dress as cool as the musician you just saw perform? In between the concert-goers great snapshots of the night, the UPshow screen at Whiskey Jam displays promotional material for the merch table. Click the above images to see some of the great Spotlights Whiskey Jam fans get to check out during the show!